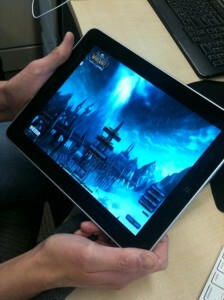 World of Warcraft in the Cloud….on the iPad? Game Designer David Perry shows everyone the power of the iPad and World of Warcraf at the tip of your fingers. David put up this photo of World of Warcraft login screen on his iPad recently, testing the Gaikai cloud server (similar to Onlive) over a standard Wifi connection. “We’re really interested to see what works well with streaming and will be trying just about every genre of game, on every device possible as we explore server-side computing,” he wrote on his blog. Pretty sweet, I know! But what does this mean for us. It means that the future of gaming could be on something as simple as an iPad. I still don’t know if World of Warcraft on iPad works but we’ll see. What does this mean for iPad cloud servers? I don’t really know, what are your thoughts?